Following our last post, the world has suddenly woken up to a new story about Nicaragua – the inter-oceanic canal. The Guardian carried its second story in as many weeks about the project (see here). Though the idea of the canal might be new to most of the media, it isn’t new to the Campaign. Anyone who knows the history of Nicaragua will know that the country was in the frame to be the original crossing for the isthmus. That it eventually ended up in Panama had much to do with the geo-politics of the time – and what the United States decided was in its best interests. Throughout the following century, a second canal has been proposed, usually through Nicaragua, sometimes through Mexico. 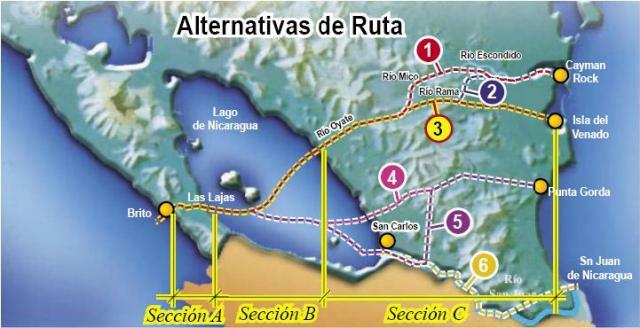 It also has undergone many different permutations – a canal, pure and simple; a canal to Lake Nicaragua, and then make use of a natural waterway; or a ‘dry canal’, Pacific and Atlantic ports connected by a railway. Or, indeed, various combinations of the three. The last bout of ‘canal fever’ started to gather pace at the end of the 90s. The Plan Puebla Panama was envisioned as a grand mega-project, linking the telecommunications, energy and road networks of Central America (for an unusual take on the PPP, see here for the Beehive Collective). It stemmed from an off-the-cuff remark by the Mexican President. It soon turned into multi-billion dollar plans, backed by the international finance institutions and various Western governments, who could smell the contracts. One of the proposals on the table was the canal. At the time (at the beginning of the noughties) the most probable route was going to be a dry canal, making use of the port of Bilwi in the North Caribbean, or in another variation, Monkey Point in the South Caribbean. The Campaign spent many months (and years) following the proposals, highlighting the deficiencies of the Plan Puebla Panama in general, and the dry canal in particular. During that time there were no serious proposals to build the canal. To the Campaign it looked to be a means of land speculation along its proposed route, something which would effect indigenous lands particularly. For about a decade the idea for the canal has bumbled along. However, for the Caribbean Coast, far more important has been the demarcation of indigenous land, under Law 445. The Coast has, for the first time, also been included in the National Development Plan, with many communities receiving electricity since the Sandinistas came to power in 2007. The Coast has also been integrated into the various social programmes associated with the ALBA, which has done much to start to tackle the severe poverty of the country. Nationally the social programmes have halved the numbers suffering from hunger, eradicated illiteracy, taken steps to improve the health service (see our previous posts). More importantly for most Nicaraguans, the Sandinista government has stablised the economy. 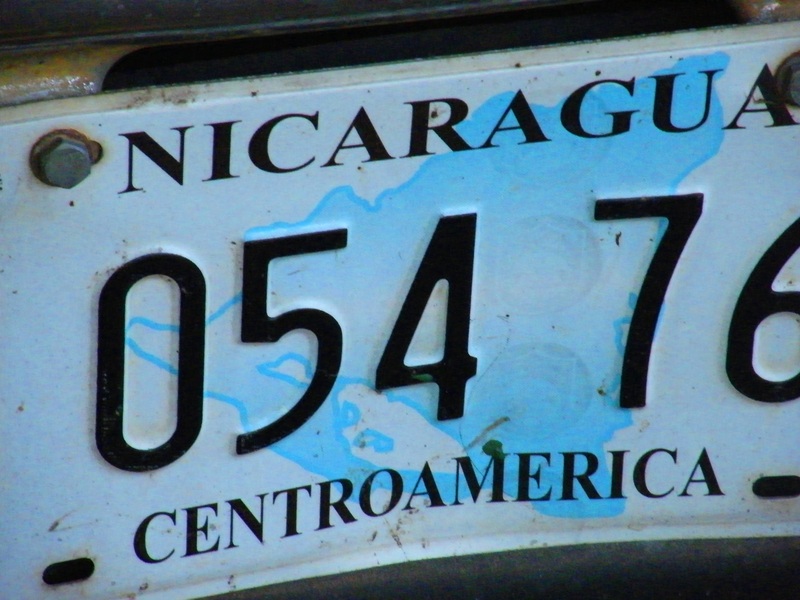 Against a backdrop of the world financial crisis and major recessions in the US and Europe, the Nicaraguan economy has grown by 4-5% annually under the Sandinistas. Despite this, most Nicaraguan commentators, from both Left and Right, agree that to eradicate poverty the economy needs a sustained bout of growth of around 10% (even this, though, doesn’t guarantee tackling poverty. Much of sub-Saharan Africa has achieved this growth figure during the past decade, coupled with a widening of the gap between the rich and poor). It was against this backdrop that Nicaragua announced its plans for the canal. Perhaps the Campaign was less surprised than some. In February we had a presentation, as part of our delegation, by Dr Paul Oquist, responsible for National Policies and Plans under the Sandinistas. Previous to this government there was a joke about the National Development Plan – the only thing wrong with it was that it wasn’t national, it wasn’t about development, and it wasn’t a plan. Oquist’s presentation outlined the current plan, the achievements of the Sandinista government, and the latest on the canal. According to Oquist the canal will cut the journey time between China and Europe from 18 to 11 days. It was this fact, and the evidence of Sandinistas delivering during their first five years, that made some of us realise that the plan for the canal was serious this time, and not just a speculator’s dream (though speculators will still be happy to see the canal being built). The Sandinista government has already commissioned two pre-feasibility studies into the canal. The press have been reporting that the first was carried out by the Chinese Railway Construction Corporation, China’s second largest construction company, which looked at several routes. The second, prepared by the Dutch consortium Royal HeskoningDHV and Ecorys, apparently only examined the route along the Rio San Juan. Between them the studies have helped generate the possible routes, with those along the Rio Oyate looking to be favoured at the moment. The CRCC will carry out the next phase of the work, developing a full feasibility study. The plans for the canal were announced at the beginning of the month. Dr Oquist says the development will deliver 10-15% growth over the next five years. Without it, growth will be half of this figure (there are still some major projects on the cards in Nicaragua over the next few years, including the Tumarin dam). At the same time the Government announced some of the major players who will carry out the feasibility study. They include: the Chinese capitalist Wang Jing, head of the Hong Kong Nicaragua Canal Development HKND) Co; Bill Wild; Ronald Maclean Abaroa; David McArthur, ERM; Stefan Matzinger and Jimmy Hexter of McKinsey; and Stephen Donehoo of Maclarty. The consultants have strong connections with China, Hong Kong and Latin America. Maclean Abaroa is a former Bolivian presidential candidate, World Banker, and an expert on governance and anti-corruption issues in Latin America. David McArthur is Environmental Resources Management for the Americas. ERM is a major player in the corporate environmental world, with 5,000 employees in 39 countries, and counts many of the major transportation and extraction MNCs as their clients. Matzinger and Hexter of McKinsey both work in the company’s Hong Kong office. Hexter, a fluent Mandarin speaker, has over two decades of experience developing projects both with the Chinese government and private sector. He is also on various US/Chinese bodies and foundations. 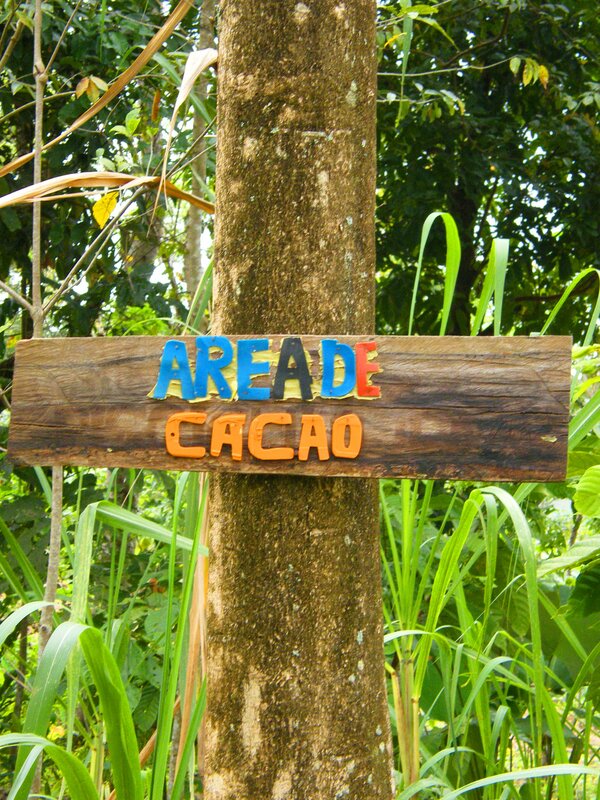 Donehoo is responsible for Maclarty’s operations in Central America and the Andes. His past jobs including working as a military intelligence officer providing advice to the US Southern Command, amongst others. Much of the focus on news reporting has focused on the ‘mysterious’ Wang Jing, head of Xinwei Telecom. Given the background of the consultant team, Wang Jing’s position would seem to be the least mysterious. Xinwei moved into the Nicaraguan telecoms mobile market last year, challenging Mexican and Russian providers. It also has numerous business ventures, both with the Chinese government and private sectors, and SE Asia. This experience, and that of the consultants, looks like an ideal way of creating a bridge to the $40 billion needed to finance the canal. Before looking at the problems with the canal, one thing needs to be clear. The Nicaraguan government is serious about developing the country, and lessening its dependence on foreign aid. With everyone agreed about the level of growth needed to do this, if the canal does not go ahead, where will the engine to drive this forward come from? Other ALBA countries have recognised these tensions, leading to internal conflicts, but also to innovative ways for funding development. Ecuador is receiving international support to leave some of its oil in the ground, though not as much as was first promised them. Any critics of the canal must also be thinking seriously which ways the Nicaraguan economy can grow, with equity, and without trashing the country. The Nicaraguan people are already formulating their own answer, as 70% were in favour of the canal in a poll conducted immediately after the announcement. Two commentaries on Tortilla con Sal (see here) have highlighted the economic benefits. They also say that the canal, through tackling poverty, will deal with the main cause of Nicaragua’s environmental problem, campesinos extending the agricultural frontier into Nicaragua’s rainforest (and indigenous land). So what have the critics said? First off the mark were the group of 21 organisations and political parties, with their manifesto ‘In Defense of National Sovereignty’. Instead of analysis (which the canal proposal sorely needs), the organisations (some of whom are funded by the United States) accused Ortega of looting the country and presiding over a dictatorship. A more serious criticism has been leveled by the likes of Maria Acosta, a Coast lawyer who has worked with indigenous communities for over a decade. She says the law passed by the Nicaraguan Assembly granting the concession allows for the ‘expropriation’ of land. This would seem to directly contradict Law 445, which has advanced steadily under the Sandinistas. It grants communal land rights to Nicaragua’s indigenous people. Since the Sandinistas returned to power in 2007, seventeen of the 22 indigenous land areas have been demarcated, with some already receiving their land titles. Depending on the route, the canal could impact on land which hasn’t been demarcated yet. For example, one of the areas where there has been problems resolving the conflict over demarcation has been in and around Bluefields. As worrying is the impact on the environment. Nicaragua lies at the heart of the Mesoamerican Biological Corridor. Although this is a construct, it is also the reality that the region contains 8% of the world’s bio-diversity, and the maintenance of this is dependent on the free migration of plant and animal species. Such a huge project, effectively slicing the isthmus in two, will put further pressure on fauna and flora already threatened by climate change. China maybe gives an indication of what could happen if things go wrong. A generation of double digit growth has lifted 400 million out of poverty. The cost has been huge environmental degradation, which the Chinese government are struggling to cope with. However, it is worth noting that the Sandinistas’ Presidential Environmental Advisor, Jaime Incer Barquero, has not given a knee jerk reaction to the canal. He is reported by the Nicaragua Network as saying “that any likely negative impact to the environment must be weighed fairly against the positive economic effects”. He said that his environmental concerns were always received by the President but that the government at times “may have other visions and other priorities.” Incer Barquero’s environmental credentials go back to the Revolution, and he is well-respected in the country. The fact that he is waiting to see what emerges from the feasibility study should give pause for thought to those who have offered immediate condemnation. Also absent from the debate (so far) has been the impact the development will have on indigenous languages. The favoured routes look likely to affect Rama and Garifuna communities, whose languages are both struggling. The Rama Kriol Territorial Government has announced it’s opposition to the project, as it was not consulted about the development, as mandated in law. The economic benefits are also not as clear cut as at first seems. Nicaragua’s dream of building the canal might now be too late to work in practice. One of the clear effects of climate change is the opening up of the Northwest Arctic passage, which might make both the Nicaraguan and Panamanian canal uneconomical for part of the year. A huge debate over the canal has started. It’s a subject that the blog will undoubtedly return to. There are two schools of reporting on Nicaragua which most people see. The first is straightforward hatchet jobs, perfected by former Latin America Guardian correspondent Rory Carroll. The latest re-incarnation is in the on-line newspaper The Nicaragua Dispatch. A good example of their output is the recent article about the US Ambassador’s speech to Nicaraguan business leaders (see here). Her remarks were reported without a trace of irony or analysis, a summary of which could be ‘you will remove the Sandinistas from power‘. A more subtle variant of this is the Good Left/Bad Left labelling of Latin American countries, with Nicaragua, Venezuela, Bolivia, Ecuador and Cuba firmly in the latter camp. The second school is found away from the mainstream. On the face of it the writers say they are supportive of the Nicaraguan people. They usually remember fondly their time in the 1980s in Nicaragua during the revolution. Then they list their disappointment with the present Sandinista government, though any facts and figures of how the government has performed since returning to power in 2007 are rarely included. What we usually have is the writer’s personal journey. It begins with the disappointment of losing the 1990 elections. It moves on to the next disappointment, the acrimonious splits within the ranks of the FSLN in the mid-90s, as the party struggled to come to terms with its defeat. They usually continue with the allegations of sexual abuse against Daniel Ortega by his step daughter, Zoilamerica. Then comes ‘el pacto‘ with the PLC – the Liberals – as the Sandinistas agreed on power sharing arrangements in return for changes in the constitution which lowered the winning threshold for first round victories in the Presidential elections. They usually conclude with the election results since 2008, which have been ‘fixed’ by the Frente. The final source of disappointment appears in both mainstream and alternative media on a regular basis. The Sandinistas supported the Bolanos government’s proposal to ban therapeutic abortion, which went before the Nicaraguan Parliament a week before the 2006 elections, after massive mobilisation by the Catholic and evangelical churches. A further variation is a form of reporting which is ‘episodic’, painting a picture of life (usually in Managua, as the reporters rarely travel further afield), which then includes swipes at the government. A recent example was by Michael Kelly, which appeared on, amongst other places, the radical website ZNet (see here for The Watchmen, the Hunters and Gatherers and the Street Vendors). Even more recent, and even worse, was a blog post by Javier Farje, editor at the Latin America Bureau and former BBC World Service journalist (see here for the post and comments). A long list of the shortcomings of the FSLN is balanced by one sentence – “Ortega’s government is implementing some of the region’s most progressive policies for the use of renewable energy, and poverty has fallen during his government” – buried in the last paragraph of the post. The allegations by Zoilamerica are serious, and have never been adequately dealt with, but the FSLN continued to choose Ortega as their candidate. Regarding the other charges, after the collapse of the Revolution the FSLN leaders would have had to have been super-human not to descend into a bitter dispute. Despite the unpleasantness of doing a deal with Aleman, it was shown to be correct as a political strategy, allowing the FSLN to regain power six years ago. This enabled them to join the ALBA, and promote a programme of pro-poor policies, which saw their vote jump to 62% in the Presidential elections in 2011. The accusations of fraud fail to mention that this was roughly what the polls were predicting, and where FSLN support remains since the elections. Therapeutic abortion needs to be re-instated, but nowhere is there serious consideration of how this can be achieved given the continued power of the church in Nicaragua, and the majority support there is for the law at the moment. This lack of weighing the record of the Sandinistas – both their achievements and their failings – leads to an overwhelming bias against the present FSLN government. Some of this may be personal, not liking the fact that Daniel Ortega still leads the Frente. Some of it may be political, a genuine disagreement about what direction the party should have taken which led to the MRS splitting from the Frente in the mid 90s. However, much of it has to do with that many former supporters haven’t got over the fact that the Revolution was overturned in 1990; that all sorts of ‘dirty’ compromises were done in order to regain power (see our recent blog here which looked at the matter);, and that the Sandinistas have come to an accommodation with their national capitalists as they seek to rebuild the country after sixteen years of disasterous neo-liberalism, and seek to pursue pro-poor programmes. There do exist descriptions of what the Sandinistas have achieved since returning to power (see here for an end of year round up for 2012). A full list would run to several pages. To take just two examples. Nicaragua announced in the past fortnight that it has cut child malnutrition from 27% in 2004 to 11.6% this year. Together with the integrated programmes that it has developed to kick-start the rural economy after the fallow years of the Washington Concensus, no wonder that it is held up by organisations like the FAO as an example of what food sovereignty can achieve. The progress in the energy sector has been no less remarkable. All that successive right wing governments achieved by 2007 was 12 hour electricity outages for most of the country. This was not only inconvenient, it also took it’s toll on businesses large and small, on children’s education, and on people’s health. The Sandinistas solved the crisis within the year, with the aid of Venezuela. They have since developed a bold plan which has made Nicaragua one of the world leaders in moving to renewables, with 50% of the electricity supply coming from wind, solar, hydro and geo-thermal. With other developments coming on stream (the not least of which is the Tumarin dam – not without its problems), Nicaragua is looking forward to getting 90% of it’s electricity from renewables by 2017. This would be a remarkable feat for a developed country with a strong commitment to de-carbonising the economy. That Nicaragua – the second poorest country in the Americas – has achieved it is nothing short of a miracle. Two excellent analyses have recently appeared. The first helps put Nicaragua in the context of developments in Latin America. The second looks at how the governments of the FMLN in El Salvador and the FSLN in Nicaragua have fared. The debate over the ‘good left’-‘bad left’ theses needs to be framed along different lines. Even if the premise of the two-left thesis regarding the basic similarities of the ‘left’ governments is accepted, the theory is fundamentally flawed. Regardless of the degree of diversity… the two-left thesis is simplistic because it ignores the complexity of the challenges they face. The victory of the Sandinista Front means, in the first place, the containment of neoliberalism and the end of neoliberal measures. Secondly, it means conquering sovereignty in the face of U.S. and European meddling. . . . In the third place, the construction of citizens’ power, as a means of restoring citizen rights, . . . means the possibility of revolutionizing representative democracy, overcoming its limitations through direct democracy. In the fourth place, but no less important, it means the associative and self-managed organization of workers and small and medium-sized producers through cooperatives and federations . . . with the purpose of recovering the surpluses drained by the market and increasingly participating in the management of the state and the market. We believe these four elements to be sufficient to talk about revolutionary struggle in any country of Latin America or the Third World. You will spend the first three nights in the capital, Managua, a sprawling, chaotic, vibrant city. You will have the chance to settle in, meet with community organisations, social movements and trade unions, to get up to speed on the country. Then you fly to Bluefields, on Nicaragua’s Caribbean Coast. It’s a world away from Managua, much poorer but much more laid back. You’ll hear Creole and Spanish on the streets, with a smattering of Rama and Miskitu. You’ll spend five nights there, including a boat ride through the rainforest up to Pearl Lagoon. You’ll be able to see how people on the Coast are struggling for autonomy and their languages, as well as taking in visits to innovative community music and food projects. Then it’s back to Managua for a night, and finally on to Granada for some relaxation. 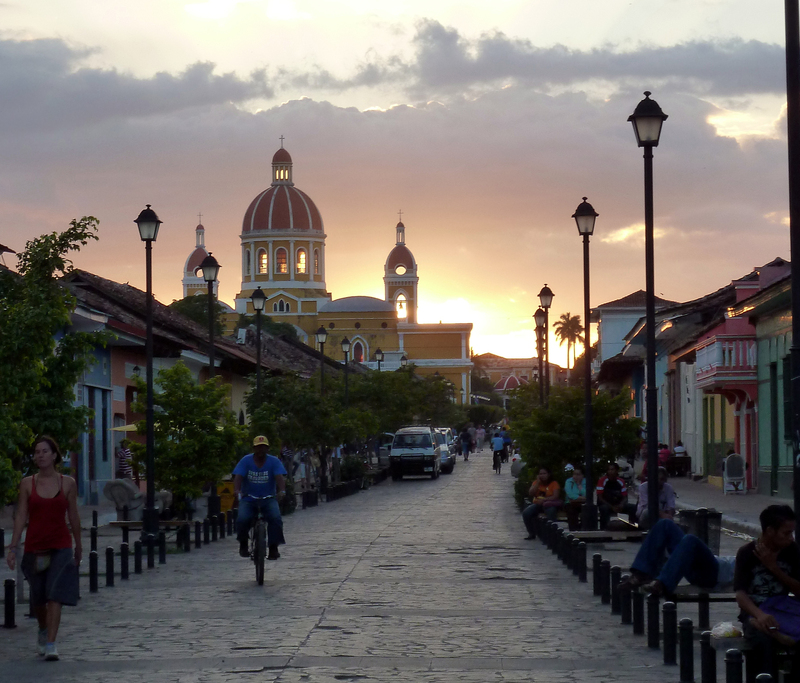 Granada is Nicaragua’s most picturesque city, with outstanding architecture, on the shores of Lake Cocibolca, and in the shadow of the Mombacho Volcano. There will also be a chance to take in the spectacular view of the Apoyo volcanic lagoon. Also, for the first time, we will be visiting the rural community of El Largatillo, to stay with families for several nights. Your total cost for the fortnight is £500, which includes all accommodation, food and travel within the country. You will also have to pay your airfare – currently tickets are between £600 and £700, and we can help with booking. We will also be organising a preparation day for the group before the journey. This will help you get the most out of your visit. ¡Buen viaje! Byddwch yn treulio eich tair noson gyntaf yn y brifddinas, Managua, dinas fywiog,ddi-drefn ac ar chwâl. Cewch siawns i setlo, cyfarfod trefnwyr cymunedol, mudiadau cymdeithasol, undebau llafur, i arfer efo cyflymder y wlad.Yna, byddwch yn hedfan i Bluefields, ar arfordir Caribi Nicaragua. Mae’n fyd gwahanol i Managua, yn llawer tlotach, ond yn llawer mwy hamddenol. Fe glywch Creole a Spaeneg ar y strydoedd, gyda pheth Rama a Miskitu o bryd i’w gilydd. Pum noson fyddwch chi yn eu treulio yma, a chewch y siawns i fynd mewn cwch drwy fforest law i Pearl Lagoon. Cewch weld sut mae pobl yr Arfordir yn brwydro dros eu hieithoedd a hunan lywodraeth, yn ogystal ag ymweld â phrosiectau cerdd a bwyd arloesol. Nôl i Managua wedyn am noson, ac yna i Granada i ymlacio! Granada yw dinas harddaf Nicaragua, gyda phensaerniaeth eithriadol ar lannau Llyn Cocibolca, ac yng nghysgod llosgfynydd Momatombo. Bydd cyfle hefyd i fwynhau golygfeydd trawiadol lagŵn folcanaidd Apoyo. Am y tro cyntaf hefyd byddwn ni’n ymweld a’r pentref gwledig El Largatillo, i aros gyda theuluoedd. 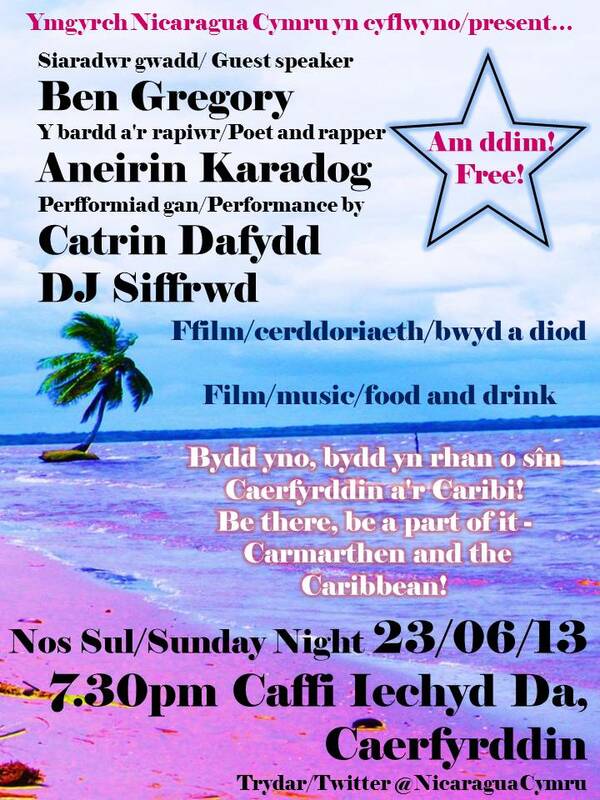 Y costau am y bythefnos gyfan yw £500, sydd yn cynnwys llety, bwyd a theithio o fewn y wlad. Bydd angen talu am y tocyn awyren hefyd. Ar hyn o bryd, maent rhwng £600 a £700, a gallwn helpu i’w archebu. Byddwn hefyd yn trefnu dydd paratoi i’r grŵp cyn y daith. Bydd hyn o gymorth i chi gael y budd mwyaf o’r ymweliad. ¡ Buen viaje!